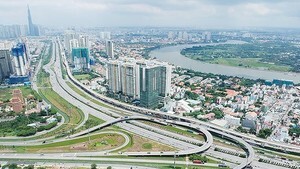 VN-Index, a gauge of 227 companies and four close-ended funds listed on the Ho Chi Minh Stock Exchange, sharply fell to below 520 on May 12 as investors sold heavily to prevent losses. The benchmark lost 14.76 points, or 2.76 percent, to 519.6 points, heading for the biggest correction in the last 37 trading sessions. Around 69.3 million shares, worth VND2.26 trillion, changed hands. On the index, 10 stocks gained, 207 fell, and 14 were unchanged. Transport company Vietnam Sun Corporation (VNS) led the outnumbered losers on the city bourse, giving up 37.27 percent to trade at VND34,500. Phuc Tien Trade Manufacture Joint Stock Company (PHT) fell 8.46 percent to VND24,900. Phuong Nam Cultural Joint Stock Corporation (PNC), a book publisher and video producer, slid 6.98 percent to VND12,000. Dong A Plastic Group Joint – Stock Company gained 4.63 percent to VND22,600 from VND21,600 yesterday. House Viet Nam Joint Stock Company climbed up 3.88 percent to trade at VND37,500. Chuong Duong Beverages Joint Stock Company (SCD) traded at VND30,000, up 3.45 percent. Saigon Securities Inc. (SSI) continued to stay at the position of the most active stock in volume with 3.23 million shares. The country’s largest brokerage closed down 3.66 percent. Saigon Commercial Bank or Sacombank (STB) was next with 2.44 million shares. Petrovietnam General Services Js Corporation (PET) followed with 2.35 million shares being traded up 1.56 percent. Hanoi’s HNX-Index finished at 174.74 points, losing 7.69 points, or 4.22 percent. More than 53.2 million shares were traded at VND1.88 trillion. The UPCoM-Index dropped 2.4 points to 52.94. A total of 289,052 shares changed hands at VND4.7 billion.